Beautiful location staff was amazing rooms have great sea side views.. I definitely will be visiting again. I liked the variety at meal times and the pleasant service from some staff members. We had to change rooms once due to uncleanliness but the second room was better. I would return to this hotel again. Where to find Hammamet hotels near an airport? Where can I find hotels in Hammamet that are near tourist attractions? There are numerous accommodation possibilities for those chasing an upscale or affordable place to stay in or around Hammamet. Expedia has 87 accommodation options within 0.1 kilometres (0.06 miles) of downtown Hammamet. Among the more central lodgings of downtown Hammamet are the Résidence Dar Hayet and Hamilton Hotel. 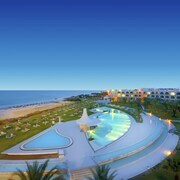 The The Sindbad and Royal Azur Thalasso Golf are both conveniently located near the Hammamet Beach. The The Sindbad is 2 kilometres (1 mile) away and the Royal Azur Thalasso Golf is 1 kilometre (1 mile) away. The Expedia team fully appreciate that travelers have different requirements and budgets. If you're seeking somewhere to base yourself that is at the more affordable end of the spectrum, Hammamet boasts some nice options to choose from. The MovieGate Hotel Hammamet is 3 kilometres (2 miles) from the heart of Hammamet, while the Lella Baya Thalasso is 8 kilometres (5 miles) away. Other budget room options include the Hotel La Couronne and the Hotel Club Les Colombes. The Hasdrubal Thalassa & SPA Hammamet is 9 kilometres (6 miles) from the middle of Hammamet. Or, alternatively, the Diar Lemdina Hotel is located 8 kilometres (5 miles) away. 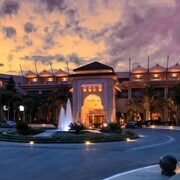 Other hotel and apartment options here are the Alhambra Thalasso and the The Russelior Hotel & Spa. 60 kilometres (36 miles) from Hammamet is Tunis, where you can find Carrefour Market and Bardo Museum. The Sheraton Tunis Hotel and Novotel Tunis are just some of the fabulous Expedia-listed apartment and hotel options in Tunis. 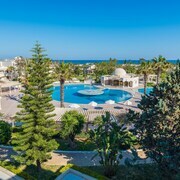 Or, you could stay in Yasmine, 8 kilometres (5 miles) to the southwest of Hammamet, where you'll find the Sentido Phenicia and Club Eldorador Salambo - All Inclusive. The Zizou Paintball Club Hammamet and Paintball Tunisie are a couple of the more popular sites to check out in Yasmine. Just because you are traveling, doesn't mean you can't indulge in your obsession for sporting events. Stade Olympique is 65 kilometres (40 miles) to the south of Hammamet. Those sports fans wanting to sleep close by can make a choice from the Movenpick Resort & Marine Spa Sousse or the Lti El Ksar Resort & Thalasso. 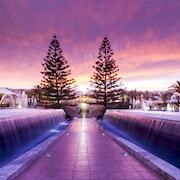 Located 60 kilometres (38 miles) from Hammamet is Tunis - Carthage International Airport. Stay nearby at Concorde Les Berges du Lac or Hotel Paris Concorde. What are the most popular Hammamet hotels? Are there hotels in other cities near Hammamet? 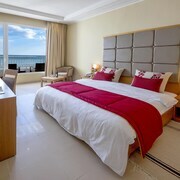 What other types of accommodations are available in Hammamet? Explore Hammamet with Expedia.ca’s Travel Guides to find the best flights, cars, holiday packages and more!